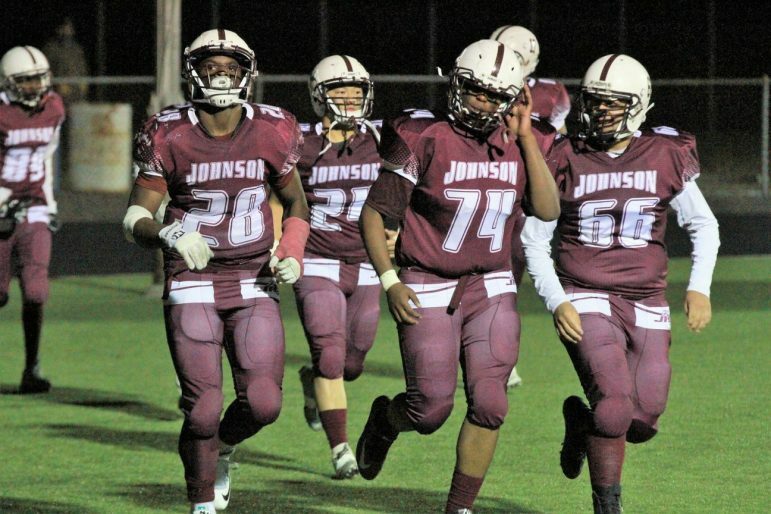 When running back Daimarion Nelson, linebacker Doua Thao, and linemen Ke’Ontae Davis and Oscar Camarena jogged onto the field of St. Paul Johnson’s 12-7 Class 4A Section 5 football championship victory over South St. Paul last week, former Johnson defensive back Tyrone Barze had previously arrived before the contest in his 2004 letterman’s jacket to show his support. “They got me wearing my letterman’s jacket,” said Barze, now a sergeant with the Minneapolis Police Department. “Had to come and support the team and my brother,” he continued as his two younger daughters looked on. With his brother, 2007 Johnson graduate Tyrell Barze — a standout in his own right on the football team during his high school career — contributing his wisdom to the Governors as an assistant coach, the older Barze looked on as sophomore Joey Moberg’s two touchdown runs, Nelson’s 96 yards rushing, and a stingy defense led them to their first state playoff berth since 1981. Running back Omar Brown’s two rushing touchdowns and two scoring passes from quarterback Zach Yeager to wide receiver Nasir El-Amin earned Minneapolis North its fourth-straight state playoff berth with a 28-0 victory over St. Agnes in the Class 2A Section 4 championship game. The Polars enter the tournament undefeated. Correction: A previous version of this story stated that Johnson captured the state championship, which was in error and has been corrected.